During the wild and wooly days of the American Basketball Association, the most popular players often were the ones who did one thing really well. Billy Paultz did everything well. Though hardly a center in the classic mold, he did not have a weakness. His strength, in fact, was being able to probe and exploit an opponent’s soft spots. Billy Paultz Jr. was born in River Edge on July 30th, 1948. He attended River Dell High, a school notable for producing another sports legend, football coach Bills Parcells. Paultz stood just a shade under 7' but did not play varsity basketball until his senior year. He attended Cameron Junior College in Oklahoma, further honing his basketball skills. Paultz eventually made his way to St. John’s University as a junior, where he played for coach Lou Carnesecca for two years. During his time in the city, he honed his game on the local playgrounds against future NBA stars. Paultz average 15.8 points 14.4 rebounds per game as a senior in 1969–70. In 1971–72, Paultz teamed with forward Rick Barry and guards John Roche and Bill Melchionni to lead the Nets all the way to the ABA Finals. Two seasons later, the lineup had turned over almost completely with the exception of Paultz. He centered for a Nets club that featured Julius Erving, Larry Kenon, Super John Williamson and Brian Taylor. The Nets defeated the Utah Stars to win the ABA title. 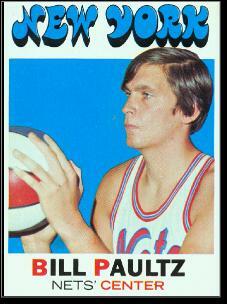 Paultz was traded to the San Antonio Spurs in 1975, prior to the ABA’s final season. He led all players in blocked shots that year and was selected to play in the league’s All-Star Game for the third time season. While many ABA players found it difficult to adjust to the demands of the NBA when the two leagues merged in 1977, Paultz continued to be an effective rebounder and shot-blocker. Although he had slowed down since his 20s, he was a clever defender. The Spurs were a 50-win team with him in the middle. In 1979, Billy became a member of the Rockets, the NBA club that had first drafted him. He teamed with Moses Malone to help the Rockets reach the NBA Finals in 1981. Paultz would up his career as a bench player for the Spurs, hawks and Jazz. He averaged 11.7 points and 8.0 rebounds per game during his 15-year pro career. Paultz found Texas to his liking as a player and remained there after his NBA career. He forged a successful second career in sales.